Chicken Rooster Plush Stuffed Animal Small is chicken stuffed animals play fun at Animal World®. The Chicken Rooster Plush is made of super soft white plush, has yellow feet and a red cob crest adorns it's head. 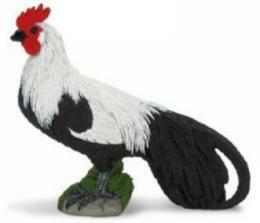 The rooster chicken plush measures 6"H x 6"L x 4"W. Shop our Chicken Rooster Gifts Store at Animal World® page for additional Chicken Rooster Gift items.